February 11, 2013 — Hydatidosis in humans occurs when the eggs of Echinococcus granulosus from canine faeces are accidentally ingested. The eggs loose their enveloping layer in the stomach, releasing the larvae. The larvae pass through the wall of the gut into the portal system and are carried to the liver where 65% of the larval load is filtered. Of the rest, 25% are trapped in the lungs (second filter) and less than 10% reach various organs through the systemic circulation . 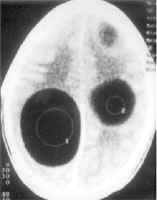 Hydatid disease is caused by two echinococcus organisms. Most are caused by Echinococcus granulosus and less frequently by Echinococcus multilocularis. E. granulosus has a dog or other carnivore as its definite host, and a sheep or other ruminant as the intermediate host. The organism resides within the intestine of the definite host and is anchored to the mucosa by hooklets. The distal aspect of the organism, called the proglottid, contains numerous amounts of eggs, which get excreted in the feces after they detach themselves from the proglottid. Grazing animals ingest the eggs, and after ingestion, the protective chitinous layer of the egg releases the embryo, which moves through the bowel wall into the portal venous or lymphatic system. The liver is the most involved organ in hydatid disease. After establishing itself in the liver, the embryo matures into a cyst. When the intermediate host dies, its organs are eaten by the definite host, and the life cycle is completed. Human infection occurs by contact with the definite host or by drinking or eating contaminated water or vegetables. 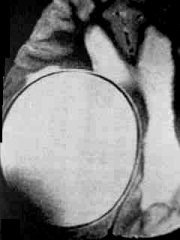 The cyst formed by E. granulosus has three layers. The host’s reaction and formation of the fibrous capsule form the outer layer, or pericyst. The size of the fibrous capsule varies between the different infected organs; in the liver, the capsule is thicker than those formed in the brain. The pericyst layer, containing blood vessels, provides nutrients for the parasite. The middle layer, a laminated membrane, is acellular and permits the flow of nutrients inward but does not allow the parasite to cross the membrane. Infection occurs when the middle layer is disrupted. The inner germinal layer produces the middle laminated layer and produces the scolex or larval stage. The scolices may also be manufactured by brood capsules (small spheres of disrupted germinal membrane) and can persist attached to the germinal membrane or combine with free-floating brood capsules to form hydatid sand or white sediment. The fluid contained within the cyst is a clear, antigenic, transudative serum-containing protein. Cyst rupture can occur and may produce no symptoms or symptoms ranging from eosinophilia to anaphylaxis. Most hydatid cysts are acquired in childhood but are not diagnosed until the 20s or 30s. Ten percent to 25% may present in childhood. 1 Many cysts are found incidentally, but most symptomatic cysts have ruptured and may be secondarily infected. The most commonly affected organ systems are the liver (65% to 75%) and lung (15% to 20%) with the remaining 5% to 20% encompassing the entire body. Central nervous system involvement occurs in 5% of cases. Cardiac contraction provides an unfavorable environment for the cysts in the heart, thus cardiac implantation is uncommon. The majority of patients with cardiac hydatidosis are asymptomatic and present due to embolic dissemination of hydatid cysts elsewhere. In a case report by Turgut et al the patient presented with cerebral hydatidosis and acute vascular occlusion of the right femoral and left internal carotid arteries, consequent to embolic dissemination from a left ventricular hydatid cyst. . Trehan et al reported a case, which presented with a left basal ganglionic infarct secondary to a left atrial hydatid cyst . However, sudden death resulting from anaphylactic shock and cardiac tamponade due to rupture of cysts into the blood stream or pericardium respectively has been reported. Location wise the left ventricle (75%), right ventricle (18%) and interventricular septum (7%) are the usual sites. Two-dimensional echocardiography is the best diagnostic procedure for demonstration of cardiac hydatid cysts . 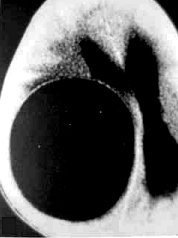 Orbital hydatid cysts typically present with gradually progressive proptosis and diminished extra ocular motility. MR and CT imaging characteristics are non-specific, and the differential diagnosis includes congenital cysts like colobomatous cysts, optic nerve sheath meningoceles and hematic cysts. 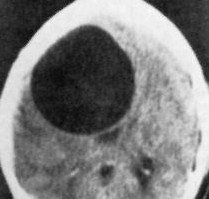 Colobomatous cysts are usually associated with micropthalmia while a hematic cyst contains blood and has a typical appearance on MRI. 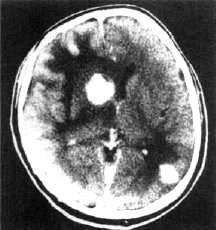 An optic nerve sheath meningoceles may occur primarily or secondarily (in association a optic nerve pilocytic astrocytoma or meningioma). These meningoceles can be associated with empty sella or enlarged subarachnoid cistern, such as gasserian cistern. In a hydatid endemic area, a unilateral intraconal cystic mass in the presence of a positive hydatid serology should prompt a diagnosis of orbital hydatid cyst . 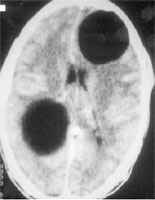 Intracranial hydatid cysts are classified as primary or secondary. The primary cysts, which are the commoner variety, are formed as a result of direct infestation of the larvae in the brain without demonstrable involvement of other organs and are mostly solitary. Supratentorial location is most frequent with a preference for the parietal lobe. These primary cysts are fertile as they contain scolices and brood capsules, hence rupture of primary cyst (e.g. during surgery) can result in dissemination. The secondary cysts on the other hand are less common and are always multiple. They arise from the rupture of a primary hydatid cyst (which may be intracranial or extra cranial). 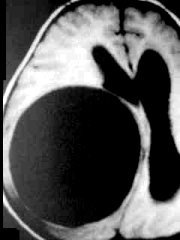 These cysts lack brood capsule and scolices and therefore are infertile and the resultant risk of recurrence after their rupture is negligible. However, recurrent secondary cysts formation can occur from repeated embolic phenomenon from a viable primary source. In the case report by Turgut et al , the patient underwent 5 surgeries over a period of 8 years for recurrent multiple intracranial hydatid cysts before the primary cardiac source was detected. Thus, it is essential to look for a primary source in case of multiple intracerebral hydatidosis, as only by eradicating the primary cysts will a cure be achieved. MR and CT cannot distinguish primary from secondary cysts. Generally, multiplicity of the cysts strongly favors the diagnosis of secondary cysts and should prompt a search for a primary source elsewhere. Both modalities characteristically show hydatid cyst as a spherical, well-defined, non-enhancing cystic lesion without peripheral edema[6,7]. The fluid density is generally equal to that of CSF on both CT and MR scan. A fine rim of peripheral enhancement with perilesional edema may be seen in the presence of active inflammation  MR scan may show a low density cyst wall  and relations with surrounding structures are better delineated than on CT scan [6,7]. Kohli et al  performed in vivo and in vitro MR spectroscopy (MRS) studies in a patient of intracranial hydatid cyst. Besides lactate, alanine and acetate, a large resonance for pyruvate was observed. 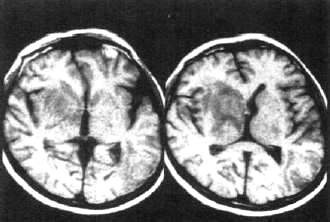 MRS pattern appeared different from the other cystic lesions of brain and they suggested MRS as an adjunct to imaging in the differential diagnosis of intracranial hydatid. Role of MRS in monitoring drug therapy was also discussed. Figure 1. A, Contrast enhanced CT scan of the orbits demonstrating a large non-enhancing intraconal cystic mass on the left side displacing the globe outwards. 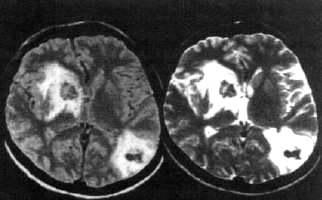 C,D, Contrast enhanced CT scan of the brain demonstrating multiple non-enhancing, varying sized, water density cysts without perifocal edema. Observe the mild effacement of the surrounding sulci. In conclusion, multiple hydatid cysts in the central nervous system are invariably secondary. A primary source should always be looked for. A cure can be achieved only by eradicating the primary source. An occult cardiac source can be overlooked and hence it is important to think about this possibility when dealing with central nervous system hydatidosis. Figure 3. CT scan (A) and TI -weighted (B) and T2-weighted (C) MR images demonstrate a large cystic mass in a patient with a suspected brain tumor. Note the lack of surrounding edema. On the T2 image there is a thin, low signal intensity rim, representing the capsule. T2-weighted MR images, the best for imaging these lesions, shows a thin, low signal intensity rim, representing the capsule, surrounding a hyperintense lesion. 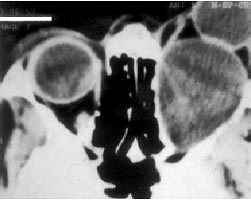 The second Echinococcus organism is E. multilocularis. It is similar to E. granulosus except that it grows by external budding of the germinal membrane. The budding causes progressive infiltration of surrounding tissues, giving rise to an amorphous semisolid or multiloculated cystic structure. Ninety-five percent of lesions occur in the liver. Brain involvement has been reported in 5% of cases and vertebral involvement in less than 1%. Surrounding edema and calcification in the wall are more common, helping to distinguish it from E. granulosus. In addition, peripheral enhancement is commonly seen. 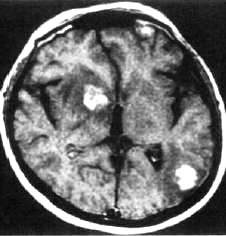 The differential diagnosis includes metastases, abscesses (including tuberculomas and fungal infection), and gliomas. A primary hepatic focus may help to distinguish these lesions from the others on the list. Figure 4. 42-year-old man with headache and weakness attributed to cerebral alveolar hydatid disease. 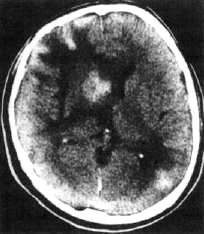 A,CT scan of head shows calcified nodular lesions surrounded by edema in right frontoparietal and left occipital regions. B, Enhanced CT scan shows nodular enhancing lesions. C1, Axial TI-weighted contiguous MR sections show heterogeneous lesions of low signal intensity.C2, Axial T2-weighted contiguous MR sections show lesions of low signal intensity. Note surrounding edema. Calcified areas produce low signal intensity and surrounding edema produces high signal intensity. D, Axial contrast-enhanced TI weighted MR image shows heterogeneous contrast enhancement. Albendazole and mebendazole are the only anthelmintics effective against cystic echinococcosis. Albendazole is the drug of choice against this disease because its degree of systemic absorption and penetration into hydatid cysts is superior to that of mebendazole. Albendazole in combination with percutaneous aspiration or PAIR therapy can lead to a reduction in cyst size, and, in one study, it improved efficacy over albendazole alone against hydatid cysts. When surgery cannot be avoided, presurgical use of albendazole in echinococcus infestations reduced risk of recurrence and/or facilitated surgery by reducing intracystic pressure. Treatment of echinococcosis for patients weighing more than 60 kg is albendazole administered PO with meals in a dose of 400 mg twice daily for 28 days. A dose of 15 mg/kg of body weight daily in 2 divided doses (not to exceed total daily dose of 800 mg) has been suggested for patients weighing less than 60 kg. For CE, the 28-day course may be repeated after 14 days without treatment to a total of 3 treatment cycles..
Onal C, Orhan B, Metis O et al , Three unusual cases of intracranial hydatid cysts in paediatric age group. Pediatr Neurosurg 1997; 26 : 208-213. Nurchi G, Francesco F, Montaldo C et al , Multiple cerebral hydatid disease : case report with magnetic resonance imaging study. Neurosurgery 1992; 30 : 436-438. Coates R, Von Sinner W, Rahm B : MR imaging of an intracranial hydatid cyst. AJNR1990; 11 : 1249-1250. Kohli A, Gupta RK, Poptani H et al : In vivo proton magnetic resonance spectroscopy in a case of intracranial hydatid cyst. Neurology 1995; 45 : 562-564.
http://yassermetwally.com/blog/?p=862You must be logged in to post a comment.